Photographers are in trouble. Marketers are starting to see the computer-generated writing on the wall: CGI is in, photos are out. When looking for industrial marketing solutions, you're searching for the best. For visuals, that's CGI. What makes CGI better than photos? If you've ever tried to take a far-away photo with an iPhone, you know the feeling. What was supposed to be a picture of a full moon on a stormy night ends up being a fuzzy mass of nothingness. No details. You can't even make out the texture of the clouds in the night sky, let alone the moon's rocky surface. Depending on the camera, capturing surface detail can be a challenge. With CGI, any surface can be convincingly rendered. The simple truth is: no camera can compete with CGI. 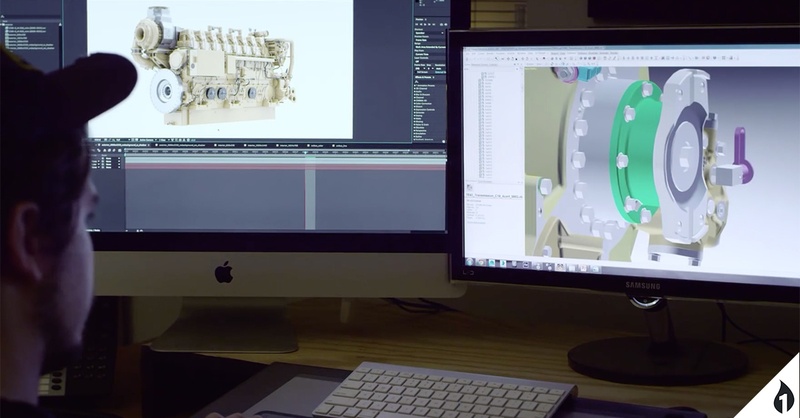 Cameras (and what they're shooting) have limitations that the CAD-to-CGI process doesn't. If you want to ensure that your products are seen exactly as you want them to be, every time, you can't rely on photography. CGI images provide consistent results. One huge limitation of the photography process is getting the light just right. For a photographer, this is a constant struggle against daylight, harsh artificial light, and the positioning of the object being shot relative to light sources. With CGI, the light can be manipulated however you'd like it to be, without the challenges photography faces. Ok, we're almost done picking on photo quality. If you're picky about your product images being perfect (and you should be), CGI is the way to go. Unlike photos, which can be blemished by fingerprints, dirt, or dust on the camera lens, CGI images are flawless every time. Photography is a time-consuming process. You have to either set up a studio and transport your product there or drag all of the equipment out to the product. The latter is often the only choice with heavy machinery or products that can't be easily moved off-site. Aside from the moving pieces, it takes a lot of work to get the right shot. With CGI, you can get the images you need without any of those roadblocks. Need to display multiple iterations of a product? CGI makes it easy. Don't let photography cause delays in your selling process. You know what's difficult to photograph? Something that doesn't exist. Amazingly, CGI can get around that, creating a visual of a product that doesn't exist from data alone. If you're looking for industrial marketing solutions that save time and money, this is it. Instead of being held up in production and delivery, you can get ahead in the sales game and put your product in front of potential customers before it exists. The best camera in the world can't replicate the razor sharp detail that CGI can create. In the CGI process, you can even alter coloring and add in badges or other symbols that would take days to match in photo editing software. Modifying a visual isn't an ordeal, it's an easier process that can be done with less stress and better detail. It's almost unfair. If you have an outdoor photoshoot scheduled for your brand new truck and it rained the night before, things will get muddy. It's the price of battling the elements when staging the ideal product shot. Using CGI, you can place your product in any environment and any condition. Spotless truck in muddy terrain? Yes. Clean combine in a dusty field? Yes. Pristine dozer in a desert? Definitely. CGI opens up every possibility for presenting your product the right way. Unfortunately, photos aren't easily modified. If a product changes, comes in a new color, you want to show new features, you have to go through the photoshoot process again. That's not the case with CGI. You can make changes when you need to. You can also reuse CGI images across every platform. In digital form, they can be printed, displayed on a computer, used in animation, and more. In large part because of its reuse potential, CGI is way less costly than photos. CGI takes less time and yields a superior visual that you can use anywhere. If you're looking for industrial marketing solutions, swapping out photos for CGI images is a huge step toward improving your industrial marketing efforts.